To meet these goals, Critical Resistance and our Anti-Policing Healthworkers developed the “Know Your Options” workshop. when moments of heightened symptoms, events or crises occur, people understand their medical needs and options. Our goal is to reduce immediate contact with policing, to reduce utilization of emergency services that draw undesired police attention, such as 911, and to support someone accessing the care they need with dignity in case there is law enforcement already on the scene (often entangled with 911 response) or stationed at the site of healthcare (hospital, clinic, etc). In all workshops, we’ll practice ways to reduce our contact with policing and minimize its impact. By then end of this workshop, we hope people are more empowered to address community health needs and to resist the violence of policing. – This workshop is designed to increase people’s understanding of mental health-related experiences, events, trauma, and conditions so that we don’t default to 911 or the cops when a baseline or escalated mental health-related event or experience happens. 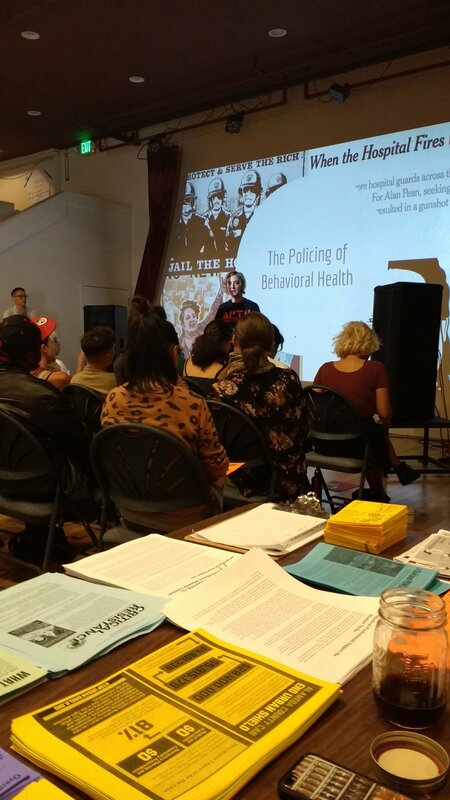 – This workshop is designed to increase people’s understanding of how policing, incarceration and gentrification drive health inequalities manifest as chronic illnesses and to empower folks who live with them to access the care they need with minimal contact with law enforcement. The workshop ends with the problem of substance use and specific training on responding to and reversing drug overdoses. – This workshop is designed to increase people’s confidence and understanding of acute injuries, ranging from gunshot wounds, knife wounds, glass lacerations, to car crashes, falls, and other unanticipated sudden health impacts. The workshop will address basic medical needs and “red flags” so people know what level of care they need to access, and guidance about how to access this care. You can request a workshop session for your organization, community group or job by filling out this form.